Esta noche va a tener lugar la primera semifinal del EMA esloveno donde 8 actuaciones competirán para conseguir una plaza para la Gran Final que tendrá lugar el próximo 24 de Febrero. 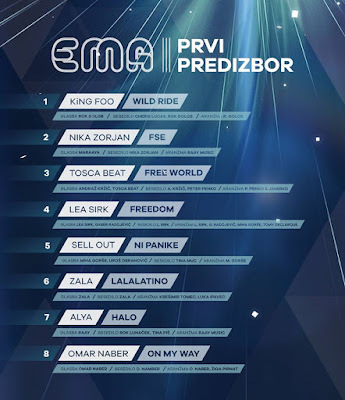 Tonight will be held the First Semifinal of the Slovenian EMA where 8 acts will compete to get a site to the Grand Final that will be held next February 24th. From the list of the 8 proposals, only 4 of them will pass to the final. The two entries most voted by the public and two more selected by the professional jury. Below you can see the list of the candidates of this First Semifinal.